An analysis of accident/injury data for 2001 through 2005 from the Mine Safety and Health Administration (MSHA) revealed that powered machinery accounted for nearly 40% of the total underground coal injuries reported and 62% of all fatalities. Underground coal miners work in an environment with limited space for lateral movement and in awkward postures, including kneeling on one or both knees. During informal discussions, MSHA and the United Mine Workers of America expressed concerns about the velocity of appendages on machines used in such environments. 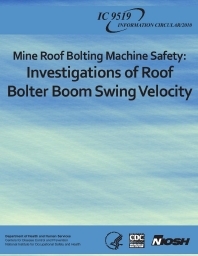 This report describes a study of operator movement relative to the motion of a roof bolting machine boom arm. This work was aimed at reducing the risk of injury to underground coal mine workers from moving machinery. The study used motion capture technology to evaluate human movement in restricted heights and postures while controlling a mockup of a roof bolter boom. Results suggest that boom horizontal swing velocity is an important factor in determining operator safety from pinch point and crush hazards during the boom positioning phase of the bolting sequence. The working height where the machine is operating, the operator's working posture, and the direction of the swing, toward or away from the operator, are also important in determining safe boom velocity.